Using environmentally-friendly bathroom fixtures and fittings is one of the easiest ways to create an eco-friendly bathroom. Many people choose to install low flow or dual flush toilets to save water, but did you know they can also save you money? Not only will your water usage reduce, but your water bill will cost less too. When choosing a toilet for your eco-friendly bathroom, check the water rating label on it to ensure you’re choosing a toilet that uses as little water as possible. The Water Efficiency Labelling and Standards (WELS) scheme ensures that bathroom fittings and fixtures which are regulated by them have a water efficiency rating from 0 to 6 stars. The more stars it has, the more water efficient it is. Not only can you get low flow toilets but you can also get low flow shower heads. These reduce the amount of water that comes out of the shower per minute, saving you heaps of water every time you shower. According to these water saving tips from the Water Corporation, showers account for 22% of household shower use. They say that swapping to a low flow shower head, you could save up to 20,000 litres of water every year. Not only will your water usage reduce, but your gas or electricity bills can end up being smaller too. You’ll be using less energy to heat your water so you’ll be paying less on your gas or electricity and reducing your impact on the environment. When it comes to designing an eco-friendly bathroom, don’t just think about your shower, toilet, sink and bath. Lighting makes up a huge amount of our household energy usage, so considering eco-friendly lighting options is crucial. LED lights are one of the most environmentally-friendly lighting options on the market today. They use minimal amounts of electricity and can drastically reduce not only your carbon footprint but your electricity bills too. Adding living plants to your bathroom doesn’t just serve an aesthetic purpose. Plants are great at cleaning the air, eliminating any harmful toxins that may be present. 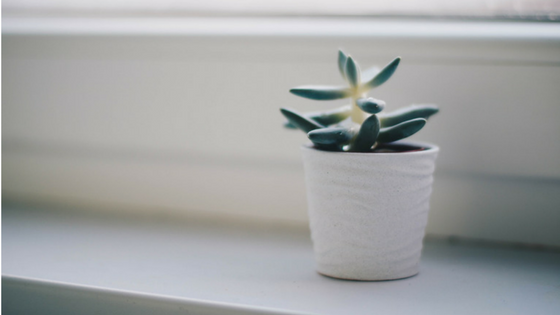 Plants also absorb the moisture in the room, reducing the humidity as well as the chance of mould starting to grow in the bathroom if not well-ventilated. Spider plants and rubber plants are particularly good at this and make great bathroom plants. Orchids thrive in bathrooms too as they prefer humid conditions and are great in small spaces due to their size. Many people are unaware of the toxicity levels in ordinary paint. When designing an eco-friendly bathroom, this is one area you should definitely consider. Paints often contain Volatile Organic Compounds (VOCs). These are harmful chemicals which have been shown to contribute to a variety of health problems such as headaches, fatigue, dizziness, blurred vision, and even cancer. Ecolour is one company in Australia that is focusing on producing zero VOC, toxic-free paint. They’ll even match any colour sample you have so you don’t have to compromise on the look and feel of your bathroom. The great thing about designing your own bathroom is that the world really is your oyster. You don’t have to opt for the same old boring vanities and countertops you see in every show home these days. Consider using sustainable materials in your bathroom such as reclaimed wood, recycled glass, or recycled aluminium. From reclaimed wood countertops, to recycled aluminium towel rails or recycled plastic shower screens, the choice is endless. If you’re planning bathroom renovations in your Perth home, speak to us before you go any further. We can help you design the perfect eco-friendly bathroom, source the best environmentally-friendly products and create a space that you love. Call us on 0451 781 384 now or send us an enquiry online and we’ll get back to you as soon as possible.